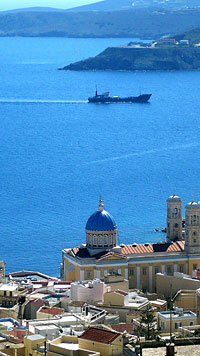 Syros is located in the centre of Cyclades and is in a distance of 83 n.m. from Piraeus. The harbor, Hermoupoli, surprises with the first glance the visitor. It was created in the Revolution of 1821, when it accepted repeated waves of refugees and fast developed in big centre of transit trade between east and west. During the economic ascent and the cultural blossoming of Hermoupoli, took shape for the first time a genuine Greek urban class. This becomes obvious in the architecture. The city is a monument itself. A walk in the streets reveals plenty of buildings from the 19th century , as the theatre Apollo, the town hall building, the cultural center, which are built with the rules of romantic classicism, but also influenced from western models. In the two hills that embrace the city we can find an element of its particularity, as the two churches that are found on their tops, the catholic temple of Saint George and the orthodox temple of Anastasis, prove the peaceful coexistence of the believers from the two doctrines. In the hill to the left side above Hermoupoli, where the catholic temple is, it is located Ano Syros (Upper Syros), the oldest medieval settlement in Greece with its walls, the small narrow streets, the innumerable stairs and the arches. Other interesting places are the villages Delagrazia, Hroussa, Episkopio with their splendid mansions, Kini, a fishing village famous for its beautiful sunset and the unspoiled scenery of Apano Meria. The island is easily accessible by boat (duration 4 hours) from the port of Piraeus. 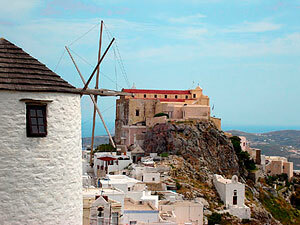 In Open Seas website you can check out all routes to and from the island of Syros.